From Artsy To Floral, Here Are 7 Awesome Mehendi Trends That Every 2018 Bride MUST Try! Whether you love mehendi or not, when you are a bride-to-be, you automatically start getting interested in the beautiful art of henna design. And given that mehendi is a huge part of Indian wedding traditions, brides usually are very specific about the kind of mehendi design they opt for. We’re sure all you 2018 brides-to-be are looking for the latest mehendi trends and so we have put together all our favourite ones in one place. From love stories immersed in your mehendi design to half and half designs, here is everything that we like to see more of in the bridal mehendi scene this year. This is the latest and prettiest bridal mehendi trend we came across and we have to say, we love it. 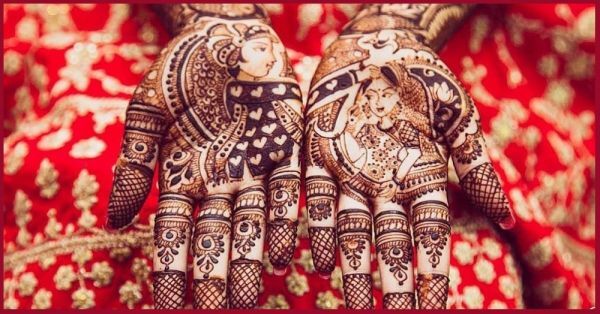 You can get a portrait formed on your hands (which makes sense when you join both your hands together) This design here shows the groom putting sindoor in the bride’s hair and it looks so pretty! Wedding hashtags are a popular concept, and couples are including their hashtags in every little detail of their wedding like the decor, the weddings invites and obviously their pictures. That is exactly why we think it’s super cool to include your hashtag in your mehendi design too. We mean, just look at it! Although this trend has been doing the rounds for a very long time, we still totally dig it. Getting a bride and groom portrait in your mehendi is a great idea and if your mehendi artist is really good, you could have him make your hubby’s and yours sketches in your mehendi design. And not just any flowers, but lotuses to be specific. Lotus motifs are really trending for bridal mehendi this year and we are not complaining, because look how pretty! If you are someone who isn’t very fond of mehendi or moved by its smell then this is just the right design for you - minimal. It looks super pretty and elegant, too. If you’re a bride who doesn’t believe in going OTT with anything, then this design is best! This is a very beautiful concept and we’re in love with it. You can get cutesy details of your love story inscribed in your mehendi design. 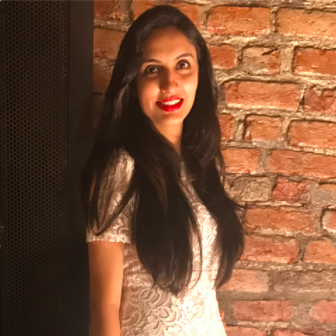 Plixxo super blogger Masoom Minawala’s mehendi is a great example of this trend. She got the London Eye and other details drawn in her mehendi because her boyfriend proposed to her in London. Cool, right? 7. Bitten by the travel bug? You could even personalize the design according to your own interests. So, if you’re both foodies, you could find a way to include that in your design and we think it makes for a superb mehendi design idea. Now that we gave you so many ideas, which one are you going to pick for your bridal mehendi?